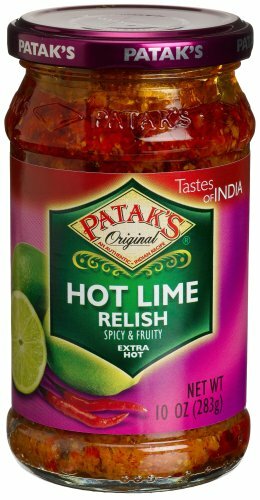 A savory blend of pickled lime, fruits and exotic spices, Patak's Hot Lime Relish is a flavorful condiment ideal for serving with naan for a simple snack, or spicing up your weeknight dinner stir-fry. Patak's Hot Lime Relish is the ingredient you need to create an authentic Indian appetizer in just minutes! Combining the traditional flavors of Indian cuisine with the modern simplicity of a no-cook dish, you're sure to love every product from Patak's! Patak's products allow you to cook with delicious flavors and the highest quality ingredients and spices! All of Patak's meal seasonings are made from the finest spices on the market - providing you with vibrant aromas and the flavors of India at your fingertips. Our Patak's Extra Hot Lime Relish is available in a convenient 10 ounce jar (6-pack), perfect for home cooking or commercial cooking! Backed by more than fifty years of Indian Cooking expertise, Patak's products will provide you with an easy-to-prepare home cooking experience! Patak's collection of home cooking products allows anyone to experience new flavors and aromas - bringing the world of Indian cooking to any kitchen. Whether you're looking for simmer sauces, concentrated curry pastes or chutneys - Patak's has what you need to get cooking!